William Bull was born in Menomonie, Wisconsin, December 27th; very little information exists regarding his early life or training. At one point he was employed by the Buckbee Mears Company, a photoengraving company in St. Paul, Minnesota, and he was known to have operated a succession of photographic studios in Twin Cities region from approximately 1910 to the late 1930s. He was one of many artists hired by Louis W. Hill, president and board chairman of the Great Northern Railway, to create promotional materials for the newly created Glacier National Park and the Glacier Park Hotel in what is now known as East Glacier, MT. Mr. Bull is believed to have spent much time in the Glacier National Park Region; one of the few historical mentions of him is a reproduction of a letter to Louis Hill dated 1923 on stationery engraved “William Bull, Photographer, Glacier Park, Mont.” The letter discusses time spend with “Mr. Guggenheim, the Earl, Count and Countess” and with Louis’ Hill’s son. There is a familiarity of tone that would suggest a longstanding business relationship or friendship between the two men. 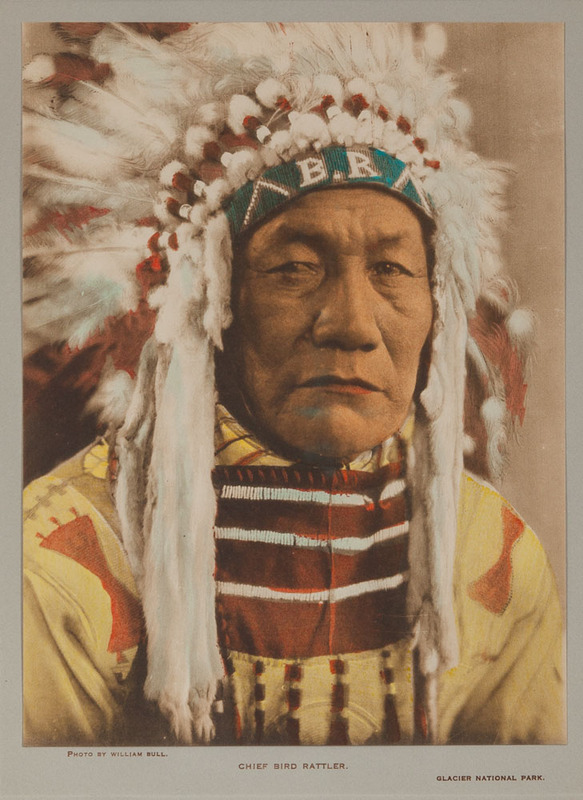 Mr. Bull was primarily a portrait photographer, and he created a collection of 12 hand-colored portraits of the Chiefs of the Blackfeet Nation in approximately 1915. These were contained in an illustrated printed portfolio and sold at the Glacier Park Hotel. Few copies are believed to exist. The photos were reproduced as Albertypes, a type of photomechanical reproduction using a gel plate – the process was created in 1869 and became increasingly popular in the late 19th Century as a means of creating multiple copies of an image prior to the advent of offset lithography. The vast majority of historic postcards created by artists like TJ Hileman for Glacier National Park were reproduced as Albertypes by the Albertype Company of Brooklyn, NY.